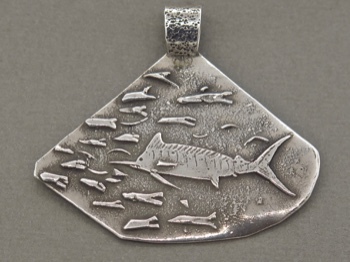 Sterling silver pendant of a blue marlin chasing a school of fish and squid, handmade by Larry McLain, local St John artist. 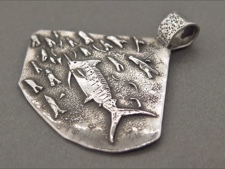 Larry's handcrafted one of a kind pieces are inspired by his deep passion for the fish, coral reefs and other creatures of the Caribbean. You can feel the quiet, meandering of this well-defined, powerful fish. He is chilling out and taking his time. 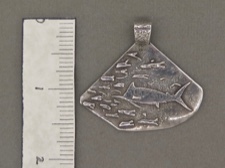 Please see below for a size reference.